‘HOW THE GRINCH Stole Christmas” by Dr. Seuss was published in 1957 and became an instant favorite for the holidays. It was first made into a cartoon TV special in 1966 and, in 2000, Ron Howard made it a live action movie version with Jim Carrey as the misanthrope called The Grinch, as narrated by Anthony Hopkins. Now comes the big screen animated version with Benedict Cumberbatch as the voice of the mean spirited Grinch who just hates Christmas, so he’s bent on ruining the yuletide holidays for the people of Whoville who love Christmas. With the help of his loyal dog Max garbed as a reindeer, he steals all the Christmas decorations and gifts of the people in Whoville, until he encounters a cute girl named Cindy Lou (voice by Cameron Seely) who melts his heart and teaches him the importance of having a family. The movie is from Illumination, which is best known for creating the Minions in the “Despicable Me” franchise and they make a good job here of coming up with visually pleasing CGI animation. But honestly, we think this is an unnecessary remake of the original Christmas tale which has become sort of a classic. The reimagining is quite colorful, but the storytelling is actually cumbersome and uninspired. 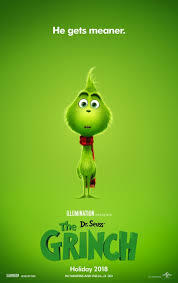 If you’re remaking the Grinch story, you’d better have something more innovative and imaginative up your sleeve because the story is already so familiar. Sorry but this new incarnation of Dr. Seuss’ beloved children’s book simply falls flat. This version even pales in comparison to the the 1966 version. And truth to tell, we most certainly prefer Scrooge in the many incarnations of Dickens’ “A Christmas Carol”.